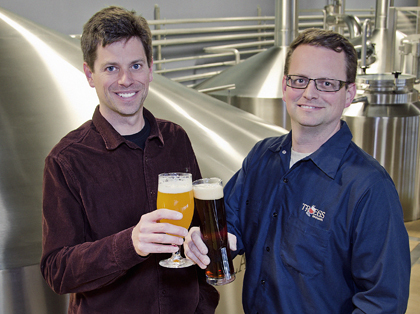 Chris and John Trogner of Tröegs Brewing Co.
Brothers John and Chris Trogner were born and raised in central Pennsylvania. After a stint in Boulder, CO, where John worked a brewery and Chris in a restaurant, they returned to their home state, and founded Tröegs Brewing Co. in Harrisburg in 1996. In 2011, Tröegs moved to a new brewery in Hershey, PA.
AAB: How did you decide to come back to Pennsylvania to open your own brewery? CT: We’d been looking at Colorado as an option, but we recognized there were a lot of breweries there—Odell’s, Left Hand, New Belgium—that were growing very rapidly. Then we looked at Pennsylvania as being a little under-served. We had some older, very traditional regional breweries, but not a huge number of craft start-ups. With the exception of Stoudt’s, of course, and Victory and a few others, there weren’t that many. So we felt there was more opportunity to come home and start a brewery. We also looked on the highway map at the proximity of large metropolitan areas. Colorado’s a beautiful state, but it can take five to eight hours to get to the next city, whereas the mid-Atlantic region, central Pennsylvania in particular, it really only takes two or three hours to get to five or six major cities on the East Coast. Was it your plan to concentrate on the Pennsylvania market? CT: We’ve always felt strongly about being a regional craft brewer. Obviously the East Coast was an enormous opportunity, but our initial focus was central PA. It took us three to four years even to send beer to Philadelphia, which is an hour and a half down the road. There must have been a big leap in volume to prompt the move of the brewery from Harrisburg to Hershey. CT: It wasn’t too different from early on, when John and I realized we couldn’t grow the brewery with just the two of us doing everything. We hit that same logic with the brewery in Harrisburg: we couldn’t sustain the growth. The brewery wasn’t designed as efficiently as it could be, it wasn’t the safest brewery, it was hard to take people through for tours, we were kind of land-locked, and we were in a flood zone. We could have made it work for another five years, but as we outgrew the brewhouse, we realized we’d have to rebuild the whole infrastructure anyway. If we were ever going to move, this was when we had to do it. How many regular and specialty beers do you brew? CT: Our core is five year-round beers, and we try to have a seasonal every three months. Then we have a lot of experimental beers, which we call the Scratch beers, and then our Splinter series. Tell me about the two series. JT: We built this brewery with flexibility in mind. We’re really curious brewers, so we like to experiment with new techniques and different ingredients. On one side we wanted a very efficient system for all our core beers, and we also wanted a platform to have fun. We put in two brewhouses, one for main production, and the other is what we call our Scratch brewhouse, a smaller version of the larger one. The inspiration for Scratch beers depends on where our minds are at the time. It’s constantly changing, so we just give each beer a number. We don’t have to worry about names, we don’t have to worry about marketing: we called the first beer we did Scratch 1. The next beer is just the next number. Julie Johnson is the technical editor of All About Beer Magazine.